Power BI allows organizations to monitor and analyze their most critical business data. As such, it’s very important for administrators to have control over how Power BI is used in their organizations. Today, I am happy to announce an exciting new update to the Power BI admin portal that provides more control for organizations. With this release, many Power BI tenant settings can be managed at a granular level: administrators can now enable or disable different Power BI features for only a subset of users in their tenant. 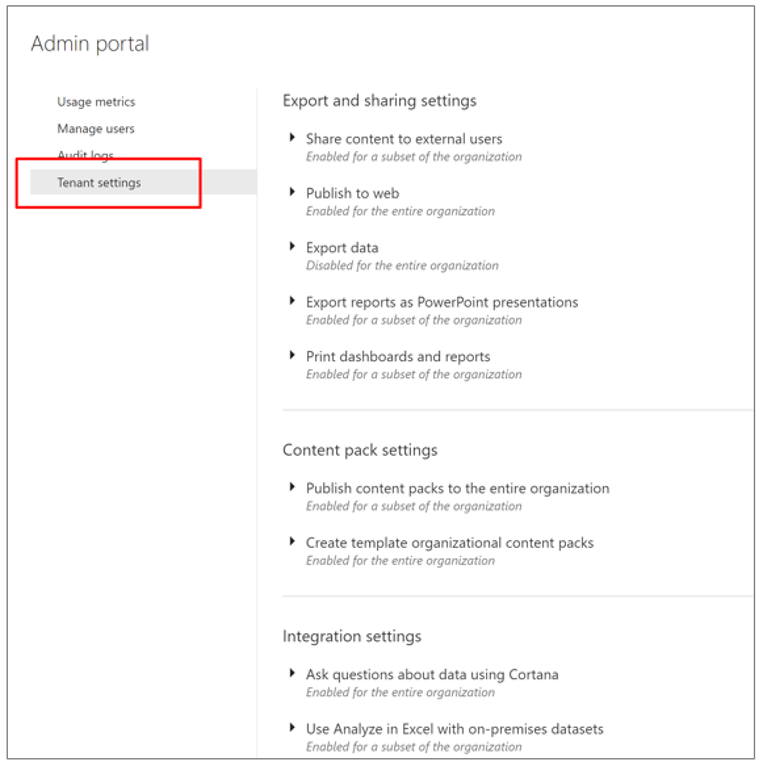 The Power BI admin portal allows administrators to view usage data and set tenant-wide controls over what Power BI features are available to their organization. For example, some organizations have concerns over data being shared externally. In those cases, they can switch off external sharing for their organization. Until now, all these settings were at an organizational level – turning them off affects all Power BI users in the tenant. We have heard from many organizations and administrators that it is critical to have better granularity for these controls. They would like to apply these settings only for a subset of users in their organization. With this release, you can do just that! Let’s dive in and see how this works. 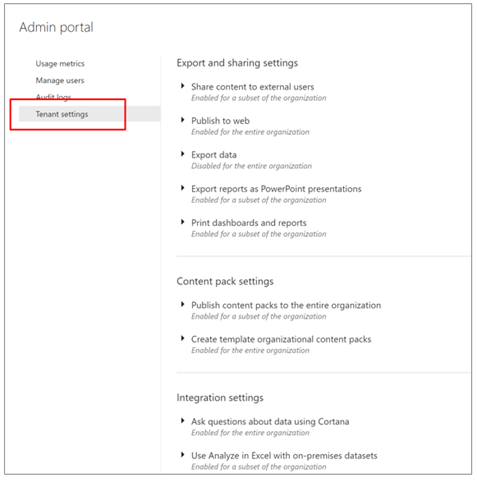 · Select the settings gear in the top right of the Power BI service. We’ve re-designed the Power BI Tenant settings page to make it easier to find the different settings and make it easier to manage the different settings. 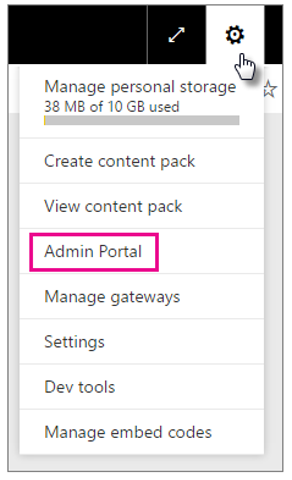 To access the Power BI admin portal, your account needs to be marked as a Global Admin within Office 365 or Azure Active Directory, or have been assigned the Power BI service administrator role. For more information about the Power BI service administrator role, see Understanding the Power BI admin role. Let’s start by changing the tenant setting for sharing content to external users. 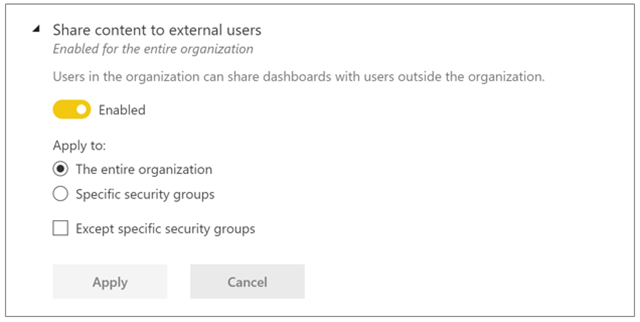 In the above image, you can see that all users in the organization can share dashboards to external users. In case we wanted to prevent all users from sharing Power BI content externally, we’d simply disable it. 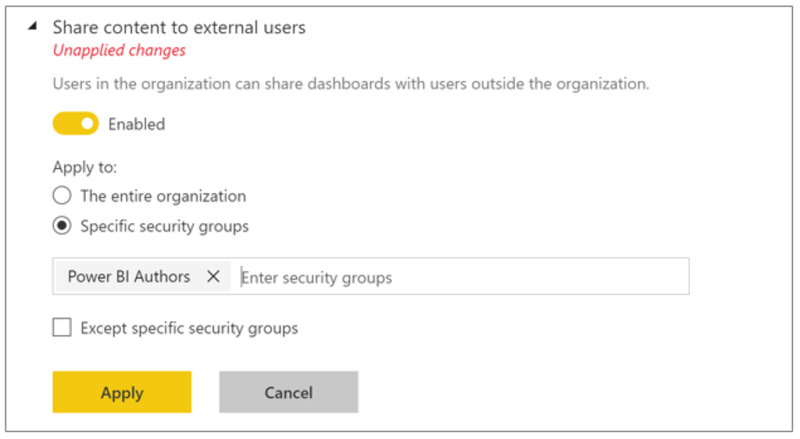 Instead, let’s say that we have a security group called Power BI Authors and we only want members of this security group to be able to share outside the tenant. To do that we would switch the setting to enabled and change the Apply to part to Specific security groups. 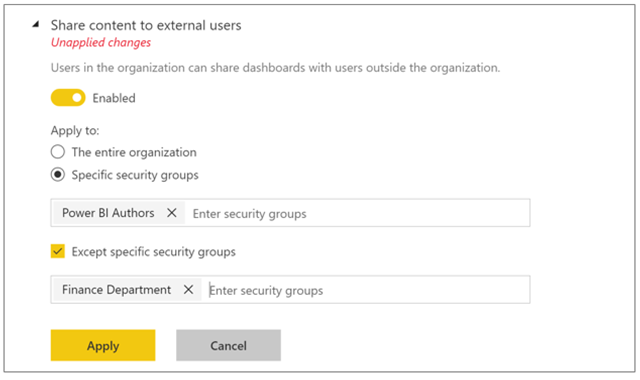 Then we would set Power BI Authors as the security group that can share externally. Once you hit Apply, only users who are in the Power BI Authors group will be allowed to share externally. Other users in the tenant will get a message that they can’t share content outside to external users! Let’s take it one more step further now. What if you wanted all users in the Power BI Authors security group to be able to share externally, except the users in the Finance department. To do that, you would check the Except specific security groups option. Then enter the corresponding security group for the Finance department. Now all members of Power BI Authors except members who belong to Finance Department can share content externally. With these different options, you have the flexibility to control exactly which users can use the different features in Power BI. We plan to make other controls like Publish to web will be made granular as well in the coming months. We would love to know what you think about this new capability. Try out the granular tenant settings today and let us know what you think in the comments below. Recently, we released the Power BI service administrator role. Previously only global tenant administrators could manage Power BI. The new role allows for Power BI specific administration. Read more about it here. The Power BI auditing preview is available to all regions except sovereign clouds. Read about that announcement here.